These are the 3 Winners of our 4th Short Film Competition. Synopsis: After a long day at work, Elena (played by Julietta Rodríguez) takes the last Metro home. Vulnerable, she will confront the unexpected and the unknown. "Subterraneo" is a short film of suspense that touches on Afro-Dominican myths. Others in the film include Socrates Montás and Dionis Rufino..
Synopsis: After living in an underground bunker for 20 years, an elderly couple decides to put an end to the torpor in which they've been living. Synopsis: A prisoner is taken for interrogation but one of his ingterrogators gets more information than he bargained for.. These are the 11 Finalists of our 4th Short Film Contest. Congratulations to everyone! Synopsis: Magnolia is an elderly woman with physical limitations and is tied to a wheelchair, her memories and the four wall of her old house. The film opens the doors to emotion that accompany old age and the search for hope. Synopsis: Maria Victoria tells the story of how she managed to survive after being born with two stomachs. She shares her joy with some children as she herself was never able to have any when she was younger. Synopsis: Joselito is a little boy who was raised alone by his single mother who has a gambling addiction and an alcohol problem which have an effect on the protagonist's behavior. Synopsis: Carlos, a war photographer, is trying to escape from the victims who appear in his photos and who are pursuing him now. Synopsis: Michael, a young man from a poor family, is easily influenced by John, his neighborhood friend, who gets him to do his dirty work. The question is: at what price? Synopsis: Dago, the leader of a group of vandals, is the only son of a failed marriage. Everyone knows Dago; he is an honest thief who keeps his word. His crimes hang over his head but his mother's persistence to get him back into acceptable society causes him conflict. Where will Dago end up? Will the conflict kill him? Synopsis: Adrian avenges the death of his wife without really knowing how it happened or what provoked the tragedy. Synopsis: After 20 years, a son meets up with his father and tells him all the pain that he has experienced by not accepting his absence. He also makes it evident that we cannot change or avoid certain aspects of human nature. Synopsis: Manuel is accused by his mother of killing her husband. He tries to escape from the psychiatric hospital where he is being treated for schizophrenia. Synopsis: A man is thrown out of the war of '65 and renounces his obligation as a Dominican to take on his obligation as a father. Synopsis: As part of a research project for an ethno-musicologist course organized by the León Center and Syracuse University, researchers visited Caña Andrés on San Antonio day. The objective was to document Dominican folk music in its broader social and cultural context. Synopsis: A young woman is questioned about her religious beliefs and does not know how to answer. A family tradegy enables her to respond to those who doubt her. Synopsis: A woman is begging God to help her understand the death of her son. She finally talks to a priest who helps her understand this accept this difficult situation. Synopsis: A woman runs away from home to escape the abuse that is subject to her husband. She escapes with her ​​daughter in her arms and on the way you will meet a man who will support her, and although it appears to be kind, hides a terrible reality. Synopsis: Carlos arrives home after a hard day at work. He reads a text message on his wife's phone that makes him believe she might be having an affair. Synopsis: A female writer who is being physically abused by her partner decides to report him. Seeking protection, she leaves him and goes to stay at her mother's house where she will try to finish her novel. But he finds out where she has gone and follows her. Synopsis: Ramón is a newspaper salesman; Papo, a delinquent by nature and María, a well-known businesswoman. Different goals and visions intermingle in a situation where lives are pushed to the limits of their beliefs. The only thing they have in common is what makes up "Un Día de Suerte" [A Day of Good Luck]. 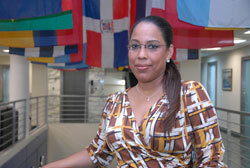 Dominican documentary maker, Martha studied film at the Autonomous University of Santo Domino (UASD). She studied screenwriting for film and political documentary production at the International Film and Television School in (EICTV in Spanish) in San Antonio de los Baños, Cuba (1989-1991). She went on to earn a Doctorate in the History and Esthetics of Film at the University of Valladolid in Spain (1995). Her latest documentary film, "Las Sufragistas" won FUNGLODE’s Max Pou award for the Best Documentary (2009); the Casandra Award (2009) for best Documentary and the Green Woman Film prize (2011) for Best Production. She has written two essays on film and has made more than twenty documentaries and short fiction films. Since 1990, she has been the representative from the Dominican Republic at the International Film and Television in Cuba. Dominican Architect with a Post Graduate degree in Project Development in Film, Documentaries and Television from the Film and Audiovisual School of Madrid, Spain. 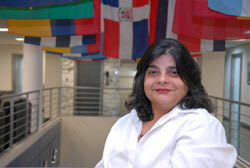 She is one of the most highly trained academics and professionals in the Dominican Republic in the areas of film. She has participated in the making of television programs, documentaries, films and music videos. Ms. Bello was the director of the first International Short Films Festival of New Cinema (Nuevo Cine), President of the Jury of FUNGLODE´s Short Film Competition, Jury member of Berlin´s Short Film Festival, President of the Academic Foundation of New Cinema, Director and Founder of the Film Training Program for the Special Programs of Altos de Chavón, School of Design. She is a professor of Film Production at the Altos de Chavón School and the Academic Foundation of the New Cinema. 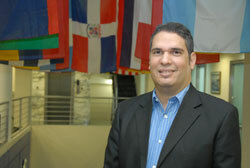 Luis Rafael Gonzalez, born in Santo Domingo, developed the Videotheque chain of stores. He organized events and film projects for the Culture Center of Spain and the Theater House. He is a founding member of the Santo Domingo International Film Exhibition and worked as Deputy Director of Programming and Diffusion (2004-2006) as well as Director General (2007-2011) of the Dominican Cinematheque. Mr. Gonzalez represented the Dominican Republic in the International Federation of Film Archive (IFFA) congresses in Japan and France, the Regional Congress of the International Federation of Film Clubs in Brazil and the First Ibero-American Congress of Culture dedicated to Film and Audiovisuals held in Mexico. He also participated in the Dominican Film Law for the Promotion of Cinematic Activity in the Dominican Republic in its early stages. He won the Les Films de L’Astre Screenwriting Competition for his script, “Dioses sin crepúsculo.” He has written other films scripts including “La mujer desechable”, “Ausente” and “Madre célula”, among other creative work. Gonzalez has also participated as an industry representative in recent editions of the Cannes Film Festival. He is a member of the Dominican Film Selection Committee (CDSF in Spanish), which chooses the Dominican film to represent the country at the Oscars and other international competitions. He has collaborated in the Festival of Film Fine Arts and the Dominican Global Film Festival. He is currently the director of the Seventh Art Company and websites related to AluCine and The Art of the Film Script. The objective of the IV Short Films Competition of the Dominican Global Film Festival (FCGD) is to promote the short film industry in the Dominican Republic; incentivize the creation and development of local film productions; stimulate and enrich the local film culture; support the film community and provide Dominican professionals with the opportunity to form professional networks and increase the visibility of local productions among the national and international film communities. This innovative competition was designed to enable beginning filmmakers to create new work and have it shown on the big screen. 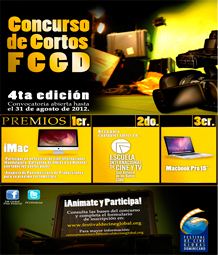 First Place: An iMac; the possibility of participating in the Guadalajara International Film Festival (Mexico), the International Film Festival of Cartagena de Indias (Colombia) or the Havana International Film Festival (Cuba) with all expenses paid. The winner will also receive support to make his/her next short film under the auspices of the Dominican film production company, Panamericana. 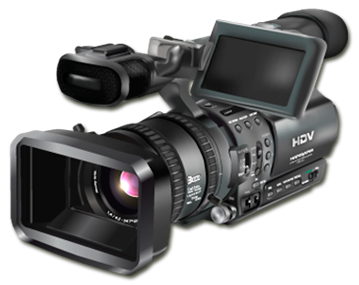 Second place: A scholarship to study at the International Film and Television School San Antonio de los Baños, Cuba (EICTV). The competition is open to Dominican directors, residing inside or outside the Dominican Republic, between the ages of 18 to 40 years. The winners will be announced on the closing night of the Dominican Global Film Festival. While the director of the short film entries must be of Dominican nationality, the shooting of the film can be done anywhere in the world as long as 70% of the actors and the film crew are Dominican. The film must have been made sometime during 2011-2012 in any format of the director’s choosing. The short films must be at least 15 minutes long, including the credits. If the original language of the short film is not Spanish, the film must contain subtitles in Spanish. With this initiative, the Dominican Global Film Festival seeks to promote the short film industry in the Dominican Republic and increase the visibility of local productions among the national and international film communities.